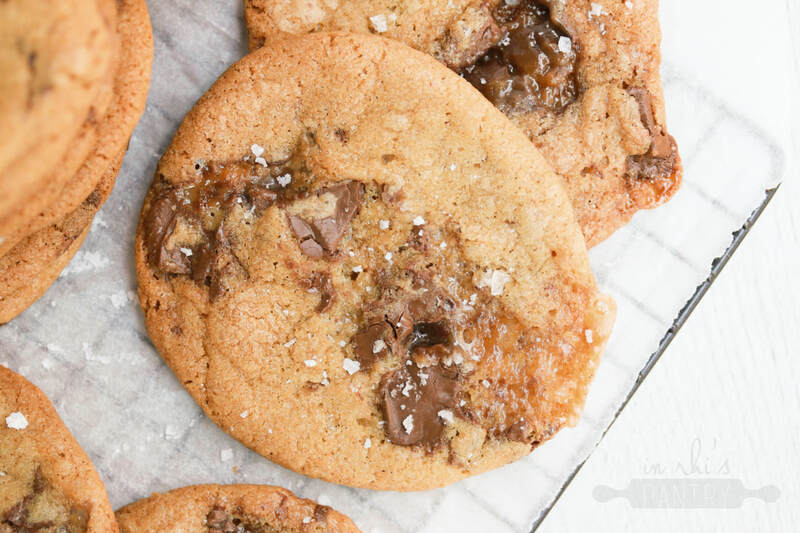 Say hello to my Brown Butter Chocolate Cookies, everyone! Recently, I came across a Buzzfeed video in my newsfeed where the endeavoured to create the perfect cookie; trialling different flour blends, fats, raising agents to come up with what they saw as the dream cookie. That's where my inspiration came along! The base of this recipe is definitely thanks to Buzzfeed, with a few little Rhi-edits to add my spin on them. Browning the butter for this recipe, although not integral if you are short on time, gives the most BEAUTIFUL flavour to these cookies. Paired with my favourite chocolate of the moment, Whittaker's Creamy Caramel (not sponsored, although, hey Whittaker's..) this makes a nutty, rich, biscuity cookie with a little chew and the perfect amount of chocolate. These are a must bake! In a saucepan, melt the butter over a medium heat. Once it hits a boil, stir the butter frequently until the butter turns a nutty brown colour. Remove from the heat immediately and carefully pour into a heatproof measuring jug. Stir, then add a little cold water until the measurement reads 1 cup. Stir again and place in the fridge to bring to room temperature. In a bowl, combine the flour, salt and baking powder. Set aside. In a large bowl, stir together the sugars and vanilla. Pour in the brown butter, and cream with an electric beater until the mixture has lightened in colour and is fully combined. Add the eggs, and beat for a further minute until incorporated. Stir 1/2 of the dry mixture into the wet ingredients, followed by the second half of flour. Stir until only just combined. Fold in the chocolate chunks until evenly dispersed through the dough. Refrigerate the dough for an hour minimum, longer if possible. Preheat the oven to 180 degrees celsius fan bake. Line baking trays with greaseproof baking paper. Scoop a heaped tablespoon sized ball of dough and roll lightly, then place on the trays (6 cookies per standard baking tray). Sprinkle with sea salt, and bake for 12-14 minutes until lightly golden. Leave to sit on the tray for 5 minutes then carefully transfer to a cooling rack. Repeat until all of the dough has been baked. Store in an airtight container for up to 5 days!